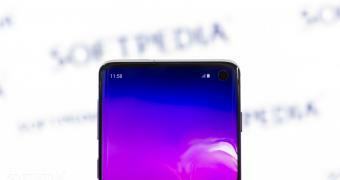 Embracing the Infinity O display with a punch-hole camera means Samsung had to ditch the front-facing LED notification light on the Galaxy S10. Instead of this super-popular feature, the company came up with a cleverer approach: it implemented a camera ring notification light that turns on for a series of predefined actions, like when opening the selfie camera. Many believed that this particular feature would also double as a notification light, which to be honest, makes perfect sense, and it also adds a modern touch to the device. And as a Samsung Care Ambassador confirmed not a long time ago, this was indeed the plan, with the South Korean firm planning to enable the feature in a future Galaxy S10 update.